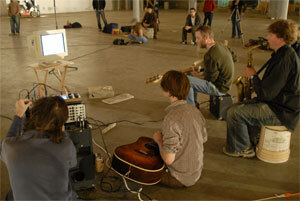 A performance of this piece consists of four players reading cues from a single computer monitor. The monitor's display is divided in to four quadrants, each displaying a flat field of color that is the same for all four quadrants. Each quadrant slowly and slightly changes brightness over the course of performance. The four quadrants of the display slowly and barely perceptibly grow brighter and darker than the other quadrants of the display. Cues are to be read from the relationship of the squares to each other: more bright, less bright, same brightness. 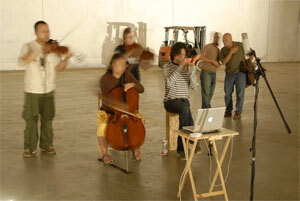 Before performance, each of the four players must choose a quadrant of the display that will serve as their own reference point for the entire performance. Each player should choose a unique position -- no two players may read from the same square. One quadrant designates pitch and one quadrant designates brightness. The brighter the pitch square grows, the higher the pitch should be; the lower the pitch square grows, the lower the pitch will be. This pitch should be "nudged" up or down. The nature of this nudging is to be determined before each performance based on the mechanics of the instrument and the goals of the performers. ****for this performance, there should be a change in pitch of about 1/10 of a semitone each time a performer decides to raise or lower their sounding pitch. Notes should be sustained at all times that the brightness so dictates. For instruments of fixed attack, like piano or guitar, extended technique, rolls or tremolo may be used to affect this sustain. The brighter the dynamic square grows, the higher the dynamic level should be. The dimmer the square grows, the quieter the dynamic should be. The dynamic range should be read as silent to medium loud. The range of brightnesses to be interpreted as silence should be relatively broad, so that each player actually plays notes about half the time.